Last year, rap phenom Eminem seemingly confirmed the release of a new album in 2013 via a fitted baseball hat. Months later, he's yet to iron out any details about the new release. 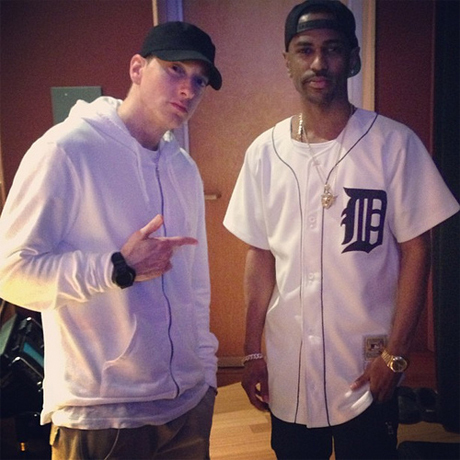 Adding to the evidence of new music on the way, however, he's recently hit the studio with fellow Detroit rapper Big Sean. The above photo arrives courtesy of Royce Da 5'9", who posted a few other studio shots to his Instagram. While it doesn't come with any more explanation, there's no question that the three rappers were repping Motor City in the studio. Last week, Sean hinted at an upcoming collab Eminem with 93.9 WKYS. You can check out that interview below. Thanks to Hypetrak for the tip.